The Zeiss Mark II Planetarium Projector was the one and only permanent and non-portable, planetarium projection system in service at The Buhl Planetarium and Institute of Popular Science in Pittsburgh, Pennsylvania U.S.A. (in addition to the Zeiss II, a small Unisphere portable planetarium projector was also used in the Discovery Lab/Lab I classroom during the 1980s and early 1990s). It was the last Zeiss Mark II to be constructed, as it was the last planetarium projector produced by the Zeiss Optical Works in Jena, Germany, prior to the beginning of World War II. During the War, planetarium projector assembly ceased, as the factory was converted to manufacturing bomb sights for German military aircraft. Later in the War, the Allies bombed part of the Zeiss Optical Works installation. The Carl Zeiss Company did not produce Zeiss Mark III (all are upgraded Mark II projectors) or Mark IV projectors until well into the 1950s. Due to the fact that there were no planetarium manufacturers available for some years after the War, the California Academy of Sciences found it necessary to construct their own projector for the Morrison Planetarium in San Francisco, now the oldest American-built planetarium projector. Buhl Planetarium's Zeiss II was the fifth major planetarium projector in the Americas. 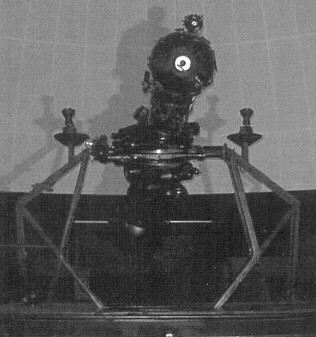 Earlier Zeiss II projectors were installed at the Adler Planetarium and Astronomy Museum in Chicago in 1930 [oldest planetarium installation in the Western Hemisphere], Fels Planetarium of Franklin Institute in Philadelphia in 1933, Griffith Observatory and Planetarium in Los Angeles in 1935, and the original Hayden Planetarium of the American Museum of Natural History in New York City in 1935. Buhl Planetarium's historic Zeiss II Projector operated while The Buhl Planetarium and Institute of Popular Science (also known as Buhl Science Center from February of 1982 through August of 1991) served as a public museum from 1939 October 24 to 1991 August 31. It also served as a teaching planetarium, when the building was called the "Allegheny Square Annex of The Carnegie Science Center" from 1991 September through 1994 February. For the last five-to-ten years of its operation, it was the oldest operating major planetarium projector in the world ! After the Buhl Planetarium building was completely closed in February of 1994, it continued to be the oldest operable major planetarium projector in the world until it was dismantled in 2002 October. The unaltered Zeiss Mark II Planetarium Projector, in Pittsburgh's original Buhl Planetarium and Institute of Popular Science, operated and presented the realistic views of planets and stars in the night sky to the general public, each day of the year (except New Year's Day in the early years; except Christmas Day in the later years) for more than 54 years !!! The original Zeiss II Planetarium Projector of Pittsburgh's original Buhl Planetarium and Institute of Popular Science was reassembled for public display-only in the Atrium Gallery of Pittsburgh's Carnegie Science Center, opening to the public on 2010 July 1. There are several claims to the title oldest planetarium. Our claim is based on the fact that Buhl Planetarium's Zeiss II is the original 1939 apparatus, with no major modifications or upgrades. The control console was updated in the 1950s, and there may have been some wiring replacements over the years [basic maintenance necessary for any electrical apparatus]. However Buhl Planetarium's Zeiss II Projector retains the same superb optics and gears it had when it began operation, 1939 October 24. 1) Planetarium of the Royal Observatory of Belgium, Brussels - This planetarium may operate the only currently active Zeiss II Planetarium Projector in the world. According to an electronic mail correspondence transmitted Mon, 8 May 2006 03:29:08 EDT from Albert Maly-Motta who lives in Hirschenhausen, Germany, this Brussels planetarium may be the one "with the oldest still operating model II in the world - the one that was used in Jena, Germany from 1926 on. After the war, it was rebuilt but is still the basic machine with some refinements added." 2) Johannesburg Planetarium, Johannesburg, South Africa - Uses a Zeiss Mark III, which originally went into service as a Zeiss Mark II in Hamburg, Germany in 1930. On 1960 October 12, this projector became the first planetarium projector in Africa and the second in the Southern Hemisphere. Today, the core of this planetarium projector could be called the oldest core of an operating planetarium projector in the world. However, prior to the Johannesburg installation, the Hamburg projector was dismantled and moved to the Carl Zeiss plant at Oberkochen, West Germany for complete overhaul and, in time, was completely rebuilt, while all the additional apparatus and improvements developed since it was originally built were added. The result was an instrument as modern and complete as any in the world, in the 1950s. Hence, it cannot be said that the entire projector is the oldest in the world. 3) Zeiss II Planetarium Projector, Osaka, Japan - The Osaka Planetarium in Japan received the first planetarium projector in the Far East on 1937 March 13. It was in use until the original museum closed in 1989, although in the later years of use this Zeiss II projector had major modifications added. In 1989, they installed a Minolta Infinium A projector in the Planetarium and Theater of the new Osaka Science Museum; the original Zeiss II is now simply on display, as a static exhibit, in the Museum. 4) Zeiss II Planetarium Projector, Rome, Italy - A Zeiss II was installed in Rome on 1928 October 28 that, apparently, was still in operation as of the 1980 printing of Carl Zeiss' "Window to the Universe" (Hagar, Charles F., Planetarium, Window to the Universe, Oberkochen, Germany: C. Maurer, Druck and Verlag, Geislingen/Steige for Carl Zeiss Co., 1980). Although, an article in the 1973 September issue of "The Planetarian" states that the original installation site is now a "cinema!" My understanding is that, like the Osaka Zeiss II, it has had some major modifications over the years. I have little knowledge regarding the status of this projector, or even if it is still in use. However, I understand that a new Rome planetarium recenly opened; I do not believe it uses the original Zeiss II Projector. The historic Zeiss II Planetarium Projector, which was in use in Rome from 1928 to 1980, will soon be reassembled for display in front of the new Rome Planetarium, according to an electronic mail message received by the author, from Stephen Wheeler, a translator working for the Rome Planetarium. More information. 5) Zeiss III Planetarium Projector (sometimes referred to as a Zeiss IV), Baton Rouge, Louisiana U.S.A. - The Louisiana Arts and Science Museum in Baton Rouge had been using a Zeiss III, which started as a Zeiss II in 1935 at the Griffith Observatory and Planetarium in Los Angeles. In the Spring of 2003, a state-of-the-art, multi-media planetarium theater was opened, with a new projector. Their Zeiss III became a static exhibit in one of the museum galleries, at that time. 6) Zeiss III Planetarium Projector, Sao Paulo, Brazil - According to Carl Zeiss' "Window to the Universe" (Hagar, Charles F., Planetarium, Window to the Universe, Oberkochen, Germany: C. Maurer, Druck and Verlag, Geislingen/Steige for Carl Zeiss Co., 1980) the planetarium in Sao Paulo, Brazil had been using a Zeiss III (all Zeiss III projectors are renovated Zeiss II projectors; no new Zeiss III Projector was ever produced) since 1957 January 26 (first Zeiss planetarium in the Southern Hemisphere; located in scenic Ibirapuera Park; operated by the Department of Culture and Museum of Science, with assistance from the School of Astrophysics; 65.6-foot diameter dome, seating 374). This planetarium received a Mark VIII "Universarium" model from Carl Zeiss in 1996. "The Zeiss III Planetarium projector that was originally installed at the São Paulo Planetarium (Brazil), was dismantled and stored - there are some plans to reinstall the machine in a new dome. The actual dome at the "Planetário do Ibirapuera" was completly rebuilt and is waiting for a Zeiss StarMaster to arrive in mid. 2006. The Zeiss Universarium VIII/XIX, bought in 1996, was installed at a second Planetarium, here in São Paulo. By the way, The official inauguration of the Universarium was yesterday (30th. november), at the "Planetario do Parque do Carmo", here in São Paulo." 7) Morrison Planetarium, San Francisco, California U.S.A. - The Morrison Planetarium in San Francisco has the oldest American-built planetarium, which opened in 1952. Basically, they built their own projector as no other planetarium manufacturer was available that soon after World War II. In California, both Griffith in Los Angeles (originally a Zeiss II installation, but used a Mark IV from 1964 through 2002) and Morrison in San Francisco have ground-up renovations lined up during the next few years. And, there may be some level of renovation of the 50' Minolta Planetarium in Cupertino, California. The Morrison upgrade is part of a major renovation of the entire California Academy of Sciences building complex, and current plans are to replace the original 65' dome with a larger, tilted dome (DEFINITELY ground-up) and retire the 51-year old, home-built Academy Projector. Provisions are being made to accomodate both a modern mechanical star projector and full-dome video. Demolition and new construction are scheduled to take place from early 2004 through late 2007 or early 2008. 8) Rosicrucian Planetarium, San Jose, California U.S.A. - Actually, the Rosicrucian Planetarium, opened in San Jose, California in 1936, was the first American-built planetarium. However, even though the original planetarium chamber was recently renovated and reopened (it reopened 2004 March 19, after being closed for six years), the original projector no longer exists. The Rosicrucian Planetarium currently uses a 30-year-old Spitz Projector. The renovation also added a new video projector to the planetarium theater, which reduced the theater seating from 100 to 98. 9) Korkosz Projector (Stellarium), Springfield Science Museum, Springfield, Massachusetts U.S.A. - An installation titled the Seymour Planetarium includes the historic Korkosz Projector, which is really a star projector or "stellarium," rather than a planetarium. The Korkosz Projector, which started presenting star shows to the public in the Autumn of 1937 (two years before the public opening of Buhl Planetarium), was designed to display the motions of the stars, but does not show the more complex motions of the planets (hence, by definition, it is not truly a "planetarium"). And, the star field is somewhat limited near the south celestial pole. However, this should not detract from the historical significance of this machine. The people at the Springfield Science Museum have shown that it is quite possible to continue the rigorous operation of a historical instrument. This is a lesson that other museum administrators [regrettably, even in Pittsburgh] could learn from. And, the Korkosz Projector is still the oldest operating Star Projector or Stellarium.